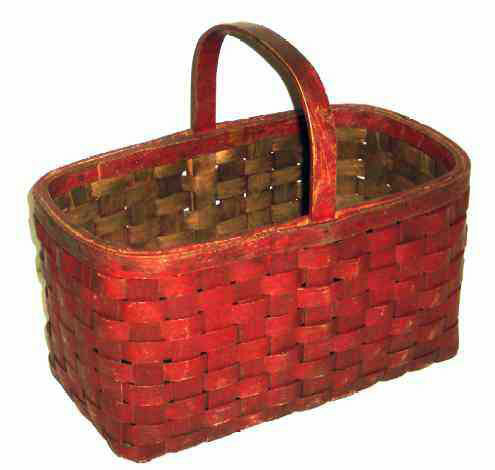 Presented here, a fine little mid-nineteenth century Splint Market Basket in fabulous, dry Cranberry paint. The camera is playing tricks again and the color is definitely cranberry, not lipstick red as shown. This basket was built for "sturdy" with a tacked rim and a fixed handle that goes down right to the bottom of the basket. The condition is excellent as is the surface with nice, dry paint . . . just the way we like it! Size is 13-1/2" l. x 7-3/4" w. x 11-1/2" high, including the handle.